INTRODUCTION: L.E. 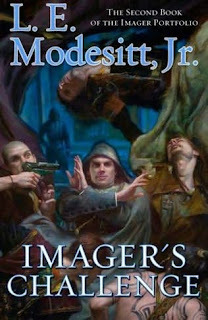 Modesitt, Jr. is the bestselling sff author of over fifty novels including The Saga of Recluce, The Corean Chronicles, and the Spellsong Cycle. He is also the author of several nonfiction books and numerous short fiction. While I read 5-6 "Recluce" books way back in the 90's and generally liked them but found them somewhat repetitive after a while, I kept following Mr. Modesitt sf and enjoyed quite a few of his offerings there, from the Ecolitan saga to The Octagonal Raven and more recently The Eternity Artifact. I also enjoyed his alt-hist with paranormal elements that starts with "Of Tangible Ghosts". Recently when I wanted to read more "immersive" fantasy and started sampling books I have skipped earlier, "Imager" attracted my attention and I read both it and its sequel "Imager's Challenge" in consecutive days, so enchanted I was by their hero and his world. OVERVIEW: In the series debut, Rhennthyl the son of a leading wool merchant in L’Excelsis—the capital of Solidar, the most powerful nation on Terahnar—was quite a talented artists and mediocre merchant so he has spent years as an apprentice and then journeyman portraitist. Skilled and diligent enough to one day become a master portraitist, Rhenn’s entire life was transformed in a single moment when he discovered he was an imager—one of the few in the entire world of Terahnar who can visualize things and make them real. Not only that but he turned out to be quite powerful, so he was taken under the wing of Master d'Esprit Dichartyn, second in the Imager hierarchy and head of all security, intelligence and military operations for the Imager academy - Collegium - which together with Solidar's powerful navy underpin the country' "superpower" status. Trained to be one a handful of "secret super agents", Rhenn succeeds spectacularly but since spotlight is fatal for secrecy, he is reassigned as L'Excelsis police liaison for the Collegium and is publicly recognized as a Master d'Aspect rather than the official "tertius". Solidar's power structure embodied in the leading Council rests on four pillars: the Guilds ie the manufacturers, the Factors ie the merchants, the High Holders ie the landholding nobility and the Collegium, with the common people and women relatively powerless politically, though there are stirrings. Extremely stable over centuries, recent developments in science and technology especially aided by Imager's abilities for fine specialized work are threatening this structure, while drug smuggling is now unofficially accepted as a method to control the poor and talented rich or noble women are allowed to have limited roles in the public sphere to contain their aspirations. CLASSIFICATION: The “Imager” series is a slower-moving but exquisite fantasy set in a European-influenced, industrial revolution-era world built on politics, commerce, and religion. Recommended for anyone who loves comprehensive world-building and characterization and a great immersive experience. FORMAT/INFO: Page count is 464 pages with a list of characters, a map of L'Excelsis and 59 chapters and an Epilogue. Narration is in the first-person, exclusively via the protagonist Rhennthyl. “Imager's Challenge” comes to a very satisfactory stopping point resolving its main threads most of which were carried from volume 1, but of course we are just starting on the big picture and the external situation is barely touched except through newspaper excerpts and conversation snippets. So while "Imager" and "Imager's Challenge" can be regarded as a "complete sub-series", Book 3 “Imager’s Intrigue”, currently scheduled for publication in Fall 2010 became a big asap novel for me. ANALYSIS: For a general discussion of the pace, character development, magic system and all, Robert's FBC review of "Imager" is the place to go since this book keeps the same traits - the world building is still superb and we slowly learn more and more, there are lots of descriptions of appetizing meals, beautiful paintings, interesting sermons and when things happen, they happen fast and furiously. There is intrigue, action of all kinds, big explosions and some ultra-spectacular magic, but the main attractions of the series remain Rhenn and the rest of the cast, Seliora, the two Maitres D'Esprit, Rhenn's mentor in the ways of the High Holders Maitre Diana and the various "working people" and taudis inhabitants encountered. As in the first novel, the villains are in the background for most of the book, but there are some superb "society" encounters between Rhenn and the Ryels, their flunkies and even some of their enemies where what is said vs what is left unsaid makes perfect reading if you enjoy the subtle art of high level sparring. I utterly loved both books and I finished "Imager's Challenge" very satisfied with the completion of the sub-series so I also strongly recommend these two novels to people looking at reading a finished product so to speak. Of course there will be more and I am looking forward to the next installments since the world of Solidar, Rhenn, Seliora and the rest became a big time favorite. Great review. I love Imager but haven't read Imager's Challenge yet, because I thought one review I read said book 2 didn't really have an ending. Is that not true? I was afraid to read it now if it ends in a cliffhanger. Nope - book 2 ends every main thread relating to Rhenn from book 1 and does not really start another so the series can go many places from here. For me Imager 1 and 2 form pretty much a complete sub-series - sure there is the big picture, political change, wars and such that may or may not be touched later, but Rhenn' story stops at a point where I could walk away happily if there were no more books. Over 50 books! My goodness, I haven't even read a single one.